In the series premiere of Fresh Pickings, host Kat Johnson takes a closer look at oats – a simple ingredient that has been used to brew beer, thicken soups, soothe skin conditions, treat osteoporosis, and even reduce the risk of heart disease. The humble oat is one of the most remarkable foods in the modern world! This episode features an interview with Kat’s mom about a favorite family recipe, Oatmeal Drop Cookies. While they’re no-bake, they can prove tricky to get just right. Then, Mary Izett, co-host of Fuhmentaboudit! shares some of the history and background of rolled (or Old-Fashioned) oats and recommends some new craft beers being brewed with oats. To wrap things up, Cathy Erway, host of Eat Your Words, shares some very clever ways to use toasted oats as a crunchy salad or dessert topping. 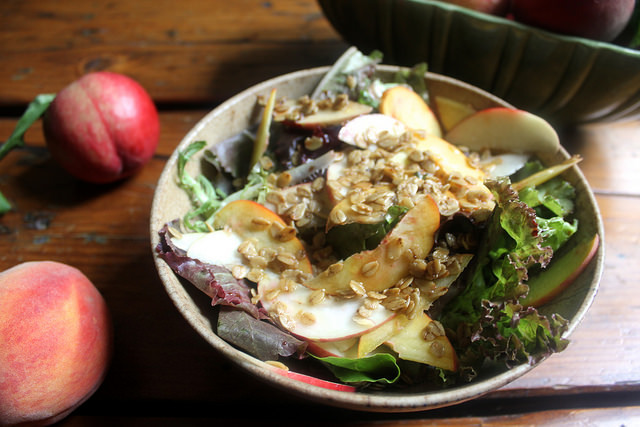 Scroll on to see her recipe for Peachy Salad with Savory Toasted Oats, so you can put this technique to the test at home! Heat the 2 tablespoons of oil in a pan over medium-high heat about 30 seconds, or until hot. Add the oats and shake or stir the pan to coat them all in the oil. Reduce heat to medium-low and sprinkle with the salt, pepper and optional cayenne. Cook, stirring frequently, another 1-2 minutes or until the oats appear lightly toasted (careful to watch for any signs or smells of over-toasting or burning). Remove from the pan immediately and set aside to cool. Toss the lettuces and the peach slices in a large bowl, and drizzle in the balsamic vinegar and remaining olive oil. Toss to coat thoroughly, and divide amongst serving dishes. Top each with the cooled oat topping and serve immediately.